Now, in Ecclesiastes 5:1-4, we get more Divine instruction to help us. You know, there are times in which you might be listening to a person speaking to you and your body is right there with them, but your mind begins to wander off into some other place – thinking about paying bills, what is due, what is past due, any illness you may have, the problems at your job. You may be thinking of going shopping or even of how hungry you have all of a sudden gotten. That is what this scripture means…keep your mind in the same place as your feet! Purpose yourself and stop your mind from going off on it’s on. It will get caught up in mess if you do not stay alert to what you are thinking and doing at all times. Now, in verse 2, Solomon tells us to be careful- not to be rash with our mouths, not to let our hearts be hasty and to utter a false word before God. We are little beings down here on earth and God is in heaven—what can we do to fix the problems that face us? Continuous praise to God is the only part of the battle that is for us to do. The Battle Is Not ours--it is God's, but we do have a part in it. Continuous Praise is all we can do. Fueled by a trusting, and faithful heart to God in the name of Jesus. Speaking rash negative words about our situations will not help us. Allowing our hearts to be heavy and anxious in front of God will not help us. God being the Final Word in all things means that there is no problem on earth that He cannot fix. Let your words be few-especially if you are feeling negative and full of self pity. If you have a need to speak--give Him praise for all He has already done for you. Praise Him for what You are expecting Him to do Now for you. Continuous Praise in all things will bring the victory to your hands. Let me give you an example to help you understand this. I know of people that complain that they do not make enough money to do the things they need to do. They pray for God to increase their paychecks from their jobs. They pray for God to send a windfall and open up the gates of Heaven and pour out a financial blessing. Now, first off, there is no money in Heaven as God does not mint money—that would be man. So there will be no money falling from Heaven. What you need to pray for from God concerning money, is for Him to open up the opportunities that will allow you to receive more money. Then you have to go and do whatever He said to do, in order to see the answers. Now, let’s say that God promotes you at your job and with this promotion comes an increase of pay. All you asked for was some more money—God has greater thoughts and decided to have man promote you, whether you deserve it or not—whether you are qualified or not. He Always Gives us More than we Asked Him for. And ususally it involves blessing more people than just one. Only the patient and steadfast will finish the race. Amen. That is what the first line of verse 3 is saying. With any dream and vision that you have, If you and God have the same purpose and will---the dreams and visions –your desires start off in the spiritual realm (as God is Spiritual) and once He manifests it in the natural and puts the completed work into your hands; with it will come “much business”. You will have to do more work or some different work. “AND it comes with painful effort.” Some of the work will give you pains and aches, dealing with difficult people, no one wants to cooperate, everyone has a me mentality. You will have to adjust to the challenges sometimes by way of painful effort. But the Effort that you put into it—God will honor and all will work out as He planned. You may now be the go-to person—the one that delegates responsibilities out to others, you may have more meetings and more people higher up than you to answer directly to. So, the dreams and visions that God will deliver to us also come with some fool taking crap to our faces or behind our backs. I for one and grateful to God for His warnings, I do not want to lose or waste anything on this journey with Him. I plan to finish this race by His plan of completion, Amen. Now, with your new promotion that God gave you in order to give you more money, (your original prayer), comes with more responsibility, some painful effort, (that will be rewarded)- and He says that some negative, doubtful, jealous, always lurking around fool will try to persuade you to give up; saying things like this= "oh, you have to do all that now, you will be here all the time; isn’t this it’s too hard? you are really not qualified for this job; oh, let me tell you what the last person who had this job had to go through; oh this is what they are saying about you"= type of TALK! Jesus says when they speak against you God is with you! But you have to fully be with God in order for Him to be with you! He said, DO NOT worry your hearts, I have asked the Father and He Has sent another Comforter! Go to the Holy Spirit when things are not right and ask Him to step in. In fact—Go to Him BEFORE things get messed up and ask Him to glaze your path with Grace so that Everything is in order for you to go that way. He has given all He has to the Holy Spirit—in order that we may be reminded of all we already know and the things that we do not know yet. When we depend on and call on the Holy Spirit to led us--He will. This last part is in John chapter 16 verses 12 and 13. At the beginning of this scripture, Jesus tells His disciples that He has so much more to teach them and to reveal to them. But they are not mature enough to understand it all right now. (don’t sow good seed on immature ground). So then they would not use it correctly to help the people or themselves-which will not help to build the Kingdom of God. This means that a lot of things that are not written down in The Bible, are held and protected by His Holy Spirit. 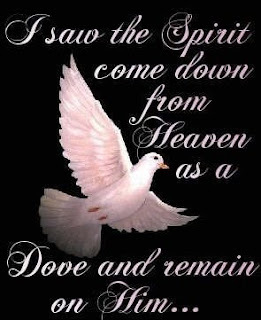 And if called upon the Holy Spirit will reveal to you the Truths that He knows. Yes, Thank You Jesus! But if you are going to act like you are on this journey alone, complaining about life, concerned about worldly issues-and all the jacked up people and situations that come around lurking for a chance to attack and entrap you--if you are going to constantly rehearse your problems to everyone, if you are going to try on your own to fix things in your life or the life of another, and only talk like and look like you belong to Jesus—you will not benefit from a relationship with God through Jesus and you will not be able to call on the Holy Spirit for help, comfort to guide you. 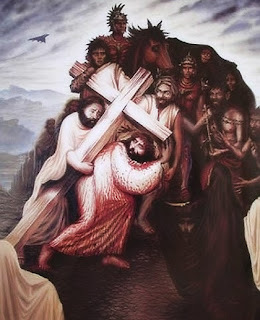 Think about when Jesus was carrying His cross to the place it would be put into the gound, no one could help Him. Before He got to that point, all the people He called good friend rejected and abandoned Him. They also called Him their good friend and They recieved Much (healing, food, shelter, protection, miracles, etc...), from their relationship with Jesus. They did not stay when God allowed the fire to be turned up. All those people that benefited from His loving generosity, were no where to be found. Sound familiar to any of you out there? 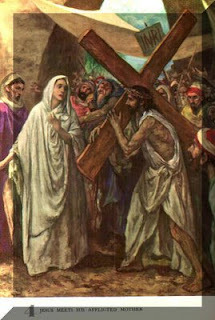 Then you are carrying your cross, now ask Jesus to help you as He has already been this way before you. He knows how to do it in order to recieve the victory and crown. Again, go back to part one of this message, start from there if you are not carrying your cross. Make sure that you have traded your yoke which is heavy and too much for us to carry for His yoke, which is light and not a burden and will help us along our way to completing this race. Ask Jesus for The other Comforter to be in your life living in you so that you are able to weather the storms of problems and trials and messes and mazes that this world has created for us to go through. I encourage you to spend quality time with God and Learn His word for yourself so that you will nurture your relationship with Him. Call upon His Holy Spirit to speak to you the things straight from God to your spirit. That is what He is one of the things that He is suppose to do for us—He gives us Wisdom from God. Not just in times of trouble--but everyday find out what the Word is from God for this day in Jesus name. This is not about relaigion--it is about Jesus and having a relationship with Him, through Him with God. *Praise You Lord……hhuummmmmmm I’m gonna carry my cross all the way Lord, with You by my side! ohhhhhh Lord, I’m gonna carry my cross Jesus all the way with You by my side! I’m gonna carry this cross all the way Lord, and change it for a crown.